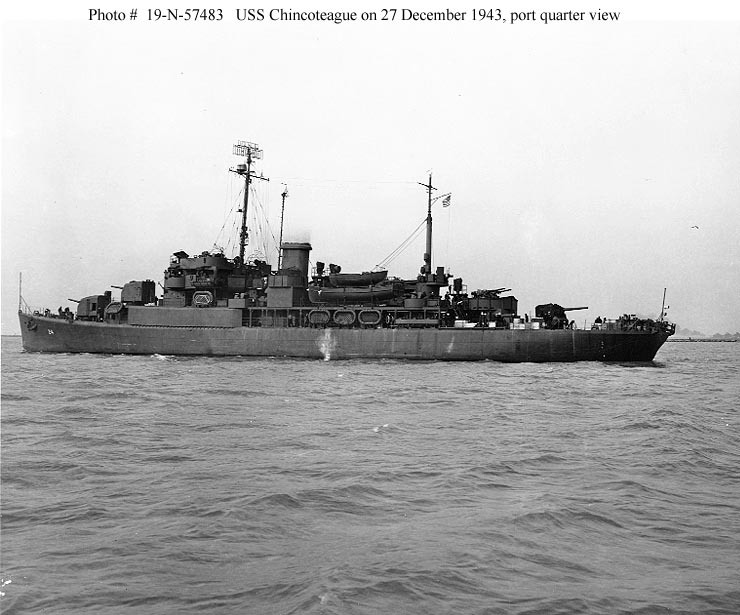 Chincoteague left Pearl Harbor in February 1944 and commenced a seven month period of duty in the western Pacific. She tended seaplanes and also carried freight, mail, and passengers in the Solomons, Marshalls, Gilberts, Marianas, and New Hebrides as well as in other locations. 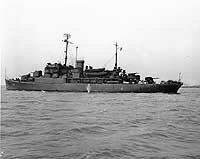 Following overhaul, she commenced salvage and rescue duty in the Palaus in December 1944 and in February 1945 joined the Iwo Jima assault force. 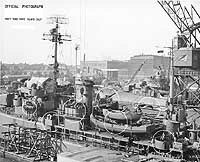 After a period of duty at Ulithi she sailed in June 1945 for an overhaul at the Terminal Island repair facility at San Pedro, California. 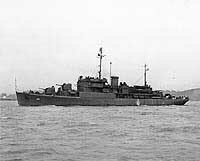 She tended seaplanes at Okinawa and at Tsingtao, China, between October 1945 and 1946 and then proceeded to Orange, Texas, for inactivation. She was decommissioned in December 1946. 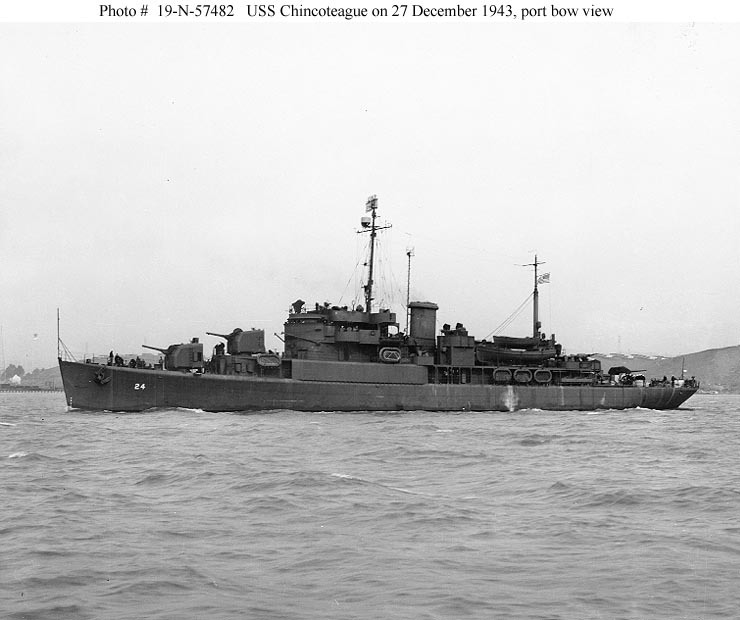 In March 1949 Chincoteague was loaned to the Coast Guard as the cutter Chincoteague (WAVP-375, later WHEC-375). She served out of Norfolk, primarily on weather station duty. She was decommissioned in June 1972 and was transferred to South Vietnam as Ly Thoung Kiet. She became the Philippine Navy's Andreas Bonifacio in April 1976 and was decommissioned by them in June 1985. 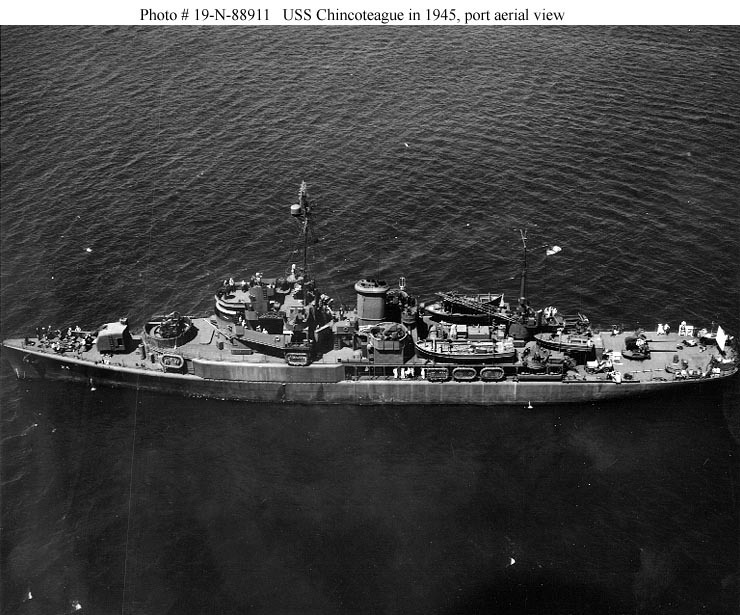 This page features all our views of USS Chincoteague. 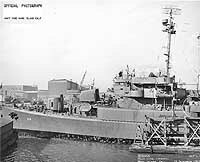 Photographed on 27 December 1943 off the Mare Island Navy Yard following repairs to severe battle damage incurred in July 1943. 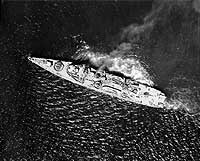 One of the four 5"/38 guns in her original armament has been replaced by a quadruple 40mm mount. A direct bow photograph taken on 27 December 1943 off the Mare Island Navy Yard. The ship had just completed repairs to severe battle damage incurred in July 1943. 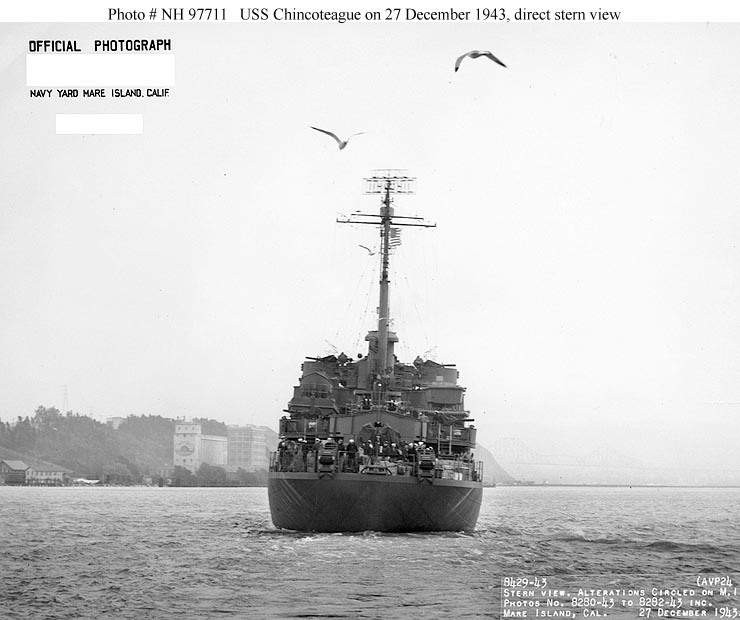 A direct stern photograph taken on 27 December 1943 off the Mare Island Navy Yard. 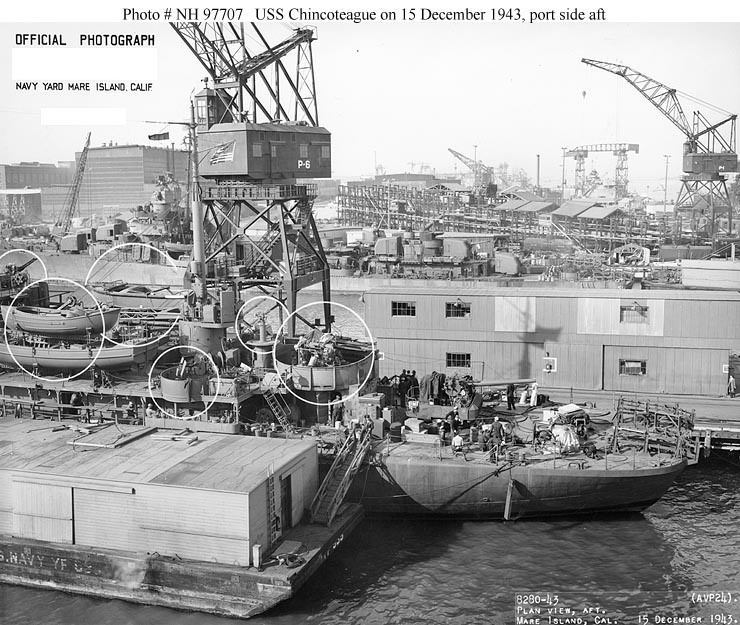 A port side view of the forward portion of the ship taken on 15 December 1943 at the Mare Island Navy Yard. The ship was completing repair of severe battle damage incurred in July 1943. Circled changes include new antennas on the foremast and just forward of the stack. 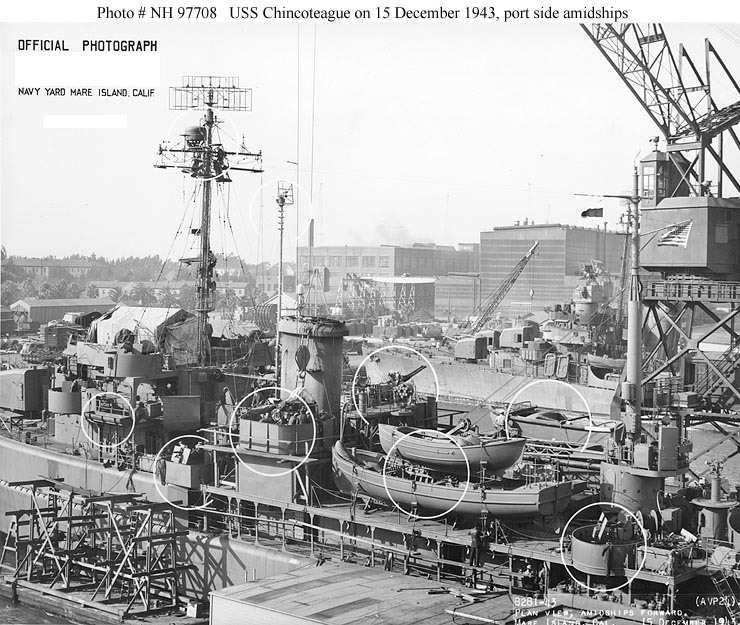 A port side view of the amidships portion of the ship taken on 15 December 1943 at the Mare Island Navy Yard. The ship was completing repairs to severe battle damage incurred in July 1943. Significant changes, mostly to the anti-aircraft armament, boat stowage, and electronic antennas, are circled. The nearest destroyer in the background is USS Thatcher (DD-514). 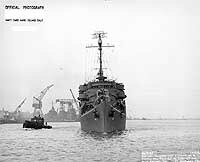 A port side view of the after portion of the ship taken on 15 December 1943 at the Mare Island Navy Yard. The ship was completing repairs to severe battle damage incurred in July 1943. Changes to the anti-aircraft armament and boat stowage are circled. The covered lighter alongside is USS YF-535, an old craft acquired in 1942. 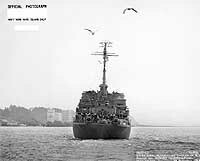 The nearest destroyer in the background is USS Thatcher (DD-514). 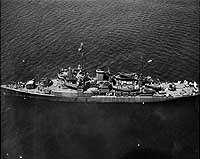 Photographed in mid-1945 following a West Coast overhaul. Her quadruple 40mm mount has been moved forward, but she retains an unshielded 5"/38 gun on the fantail. 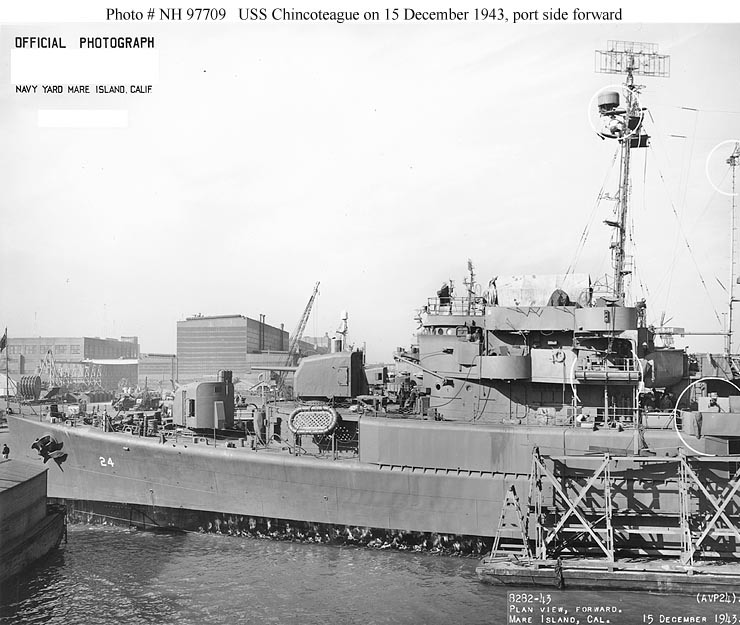 USS Chincoteague (AVP-24) probably photographed in December 1943. 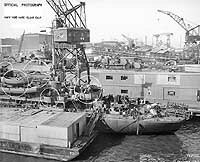 A near-port broadside view that appears to be in the same series as the 27 December 1943 Mare Island photos shown above. USS Chincoteague (AVP-24) at anchor in the western Pacific on 30 April 1945 with USS Cumberland Sound (AV-17) and several seaplanes in the distant background.